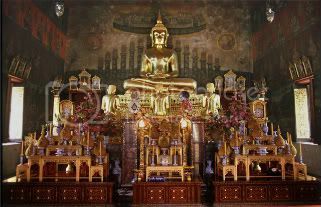 Wat Rakhang is one of the old iconic temples in Thailand. Wat Rakhang together with Wat Indraviharn is famous for their somdej (pronounced somdet) amulets. Mainly attributed to Somde Toh, or otherwise known as Phra Buddhacharn Toh Promarangsi. He grew up in Wat Indraviharn and practiced in Wat Rakhang as a monk. He lived from 1788-1872. He is credited for popularising the powerful and very well known, Jinnabunchorn Katha which he attained from ancient Sri Lankan (Ceylon) text. In terms of amulets he is credited for creating the most powerful somdej amulets of recent time, mainly attributed to tje special incantations/mantras which he used during the creation and blessing process. Somdej Toh passed down his knowledge to his monks at Wat Rakhang and Wat Indraviharn (Wat In).